In a large bowl, toss cauliflower, oil, marjoram, salt and pepper. Spread on a large rimmed baking sheet and roast until cauliflower begins to soften and brown on the bottom, about 15 to 20 minutes. 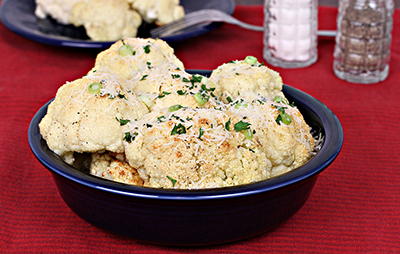 Toss the cauliflower with balsamic vinegar and sprinkle with parmesan cheese. Return to the oven and roast until the cheese is melted and any visable moisture has evaporated, about 5 to 10 minutes more. Serve garnished with freshly chopped parsley, if desired.